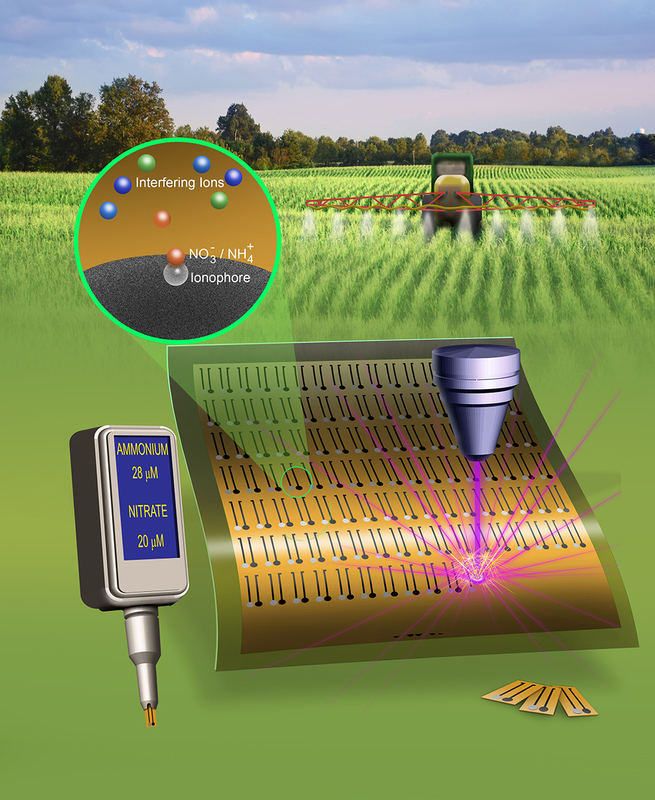 Iowa State and Florida engineers are developing a system of low-cost, flexible, graphene-based biosensors connected to wireless networks that enable rapid monitoring of nitrogen levels throughout a farm field. Larger image. Illustration by Robert Gates. AMES, Iowa – The satellite images are full of red warnings: Miles and miles of bright red along the Louisiana coast; boiling reds covering most of Florida’s Lake Okeechobee. The images show harmful algae blooms that the U.S. Environmental Protection Agency says can create toxins, endanger human health, kill fish and wildlife, rob water of oxygen and otherwise create environmental trouble. Engineers at Iowa State University and the University of Florida are working on a new system of “bury-and-forget” soil sensors and remote, wireless, data-collection networks that could help reduce the fertilizer that leaves farm fields and feeds the harmful algae blooms both states are working to control. Iowa’s efforts are, in part, aimed at reducing fertilizer drainage and runoff that flows down the Mississippi River and contributes to the “dead zone” of oxygen-depleted water in the Gulf of Mexico along the Louisiana coast. The healthy-soil system envisioned by the engineers could help reduce the amount of nitrogen fertilizer that leaves farm fields by using data from the sensors to build better models of the interactions of fertilizer, soil and crops. Those models could help farmers reduce the fertilizer they use. Currently, famers test for soil nutrients by taking soil samples and sending them off for laboratory analysis. That can be a slow, expensive and imprecise process. The project is supported by a two-year, $300,000, “Signals in the Soil” grant from the National Science Foundation. The engineers hope to collect enough data and demonstrate enough potential to successfully compete for more funding and additional research. In addition to Claussen, the research team includes three engineers from the University of Florida in Gainesville: William Eisenstadt, a professor of electrical and computer engineering; Melanie Correll, an associate professor of agricultural and biological engineering; and Eric McLamore, an associate professor of agricultural and biological engineering. Claussen has expertise in developing low-cost, flexible sensors based on inkjet-printed and laser-treated graphene circuits. The sensors in this project will detect ammonium and nitrate ions in soil. Claussen hopes they’ll work for an entire growing season. Eisenstadt has expertise in electronics and wireless sensor systems. Correll has expertise in crop modeling, including soil biochemistry. And McLamore has expertise in environmental-agricultural chemistry as well as biosensors. The engineers will build the sensors, connect them to a wireless network, test how deep the sensors can be buried while maintaining network connections, build a testbed facility using tomato plants as a model crop and collect high-resolution nitrogen data from the soil while monitoring plant growth. And that could help lead to satellite images of algae concentration showing greens and blues instead of red warnings. Iowa State's Jonathan Claussen is leading a team of engineers developing a system of low-cost, "bury-and-forget" soil sensors connected to a remote, wireless, data-collection network. Data collected by the system will help the engineers build better models of the interactions of fertilizer, soil and crops. Those models could help farmers reduce their use of fertilizer, which can run off fields and contribute to harmful algae blooms. “Flexible Laser-Induced Graphene for Nitrogen Sensing in Soil,” ACS Applied Materials and Interfaces, DOI: 10.1021/acsami.8b10991.